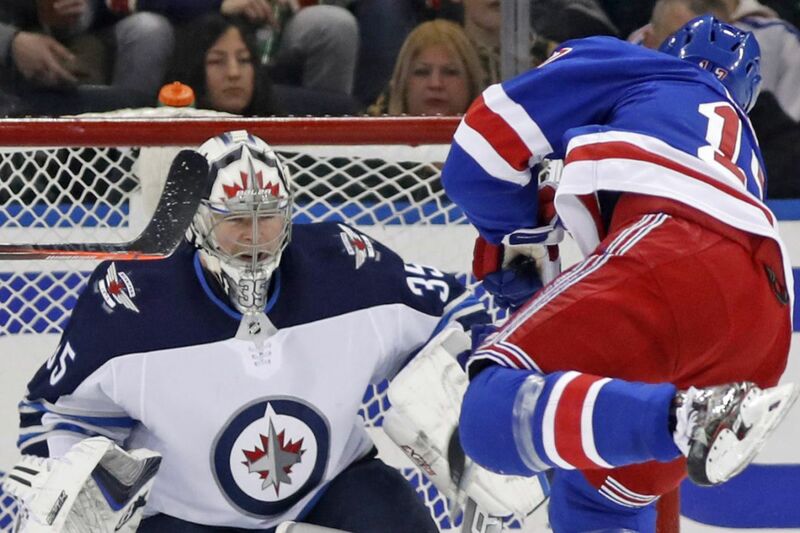 Former Flyer Steve Mason stopping Rangers right winger Jesper Fast in Winnipeg’s 3-0 win Tuesday. The Winnipeg Jets are having a remarkable season. Goalie Steve Mason is not. Mason, the former Flyer who is in his first year with the Jets, was ineffective early in the season and lost his starting job to Connor Hellebuyck. Since then, he has suffered two concussions, and he went down with an undisclosed lower-body injury during Winnipeg's morning skate Thursday. Mason, the third-winningest goalie in Flyers history, is not expected to dress for Saturday's matinee between the fading Flyers (34-23-11) and the Jets (41-17-9) at the Wells Fargo Center. On Tuesday, Mason stopped 31 shots in his first game for the Jets since Jan. 5 – he had missed about two months because of a concussion – and he blanked the New York Rangers, 3-0. It has been a trying season for the 29-year-old. He has struggled to stop pucks consistently, and he suffered his second concussion when he took a shot off his mask during a Jan. 13 morning skate. Mason has played in just 12 games with the Jets and is 4-6-1 with one no-decision. He has a 3.18 goals-against average and .906 save percentage. In the off-season, he signed a two-year free-agent deal with Winnipeg that has an annual $4.1 million cap hit. Mason's 104 wins with the Flyers are surpassed only by Ron Hextall (240) and Bernie Parent (232). Earlier this season, Mason said the Flyers had saved his career, which had bottomed out in Columbus. Sean Couturier leads the Flyers with 29 goals but hasn't scored in 10 games, his longest drought of the season. He had a goal and an assist in the Flyers' first game against Winnipeg this season. … Jets star center Mark Scheifele, who missed Thursday's 3-2 win in New Jersey with an upper-body injury, will not play Saturday. Scheifele has 51 points in 50 games. … The Flyers blew a 2-0 lead and dropped a 3-2 shootout in Winnipeg on Nov. 16. Scheifele tied that game with 49 seconds left in regulation against Brian Elliott, and Hellebuyck made 30 saves to get the win. … Winnipeg's Patrik Laine, 19, has 75 career goals (39 this season), the fifth-most ever scored by a teenager.